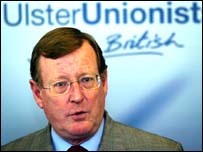 Former Ulster Unionist leader David Trimble has launched a strong attack on the leadership of the Orange Order. Mr Trimble, an Orangeman, said some unionists had entered into a 'Faustian pact' with elements of the Order in 1998 to bring down the Agreement. He was speaking at the launch of a book by a Presbyterian minister and Orangeman which is also highly critical of those at the top of Grand Lodge. He said it was "disappointing" to see the way senior officials had behaved. "It is disappointing for me as an Orangeman, which I have been and intend to continue to be," he said. He was speaking at the launch of The Orange Order - A Tradition Betrayed, written by Reverend Brian Kennaway. Mr Trimble said: "There's no doubt that the standing of the Order in the community has diminished and there's no doubt that the Order is now in a much more difficult position than it was, say, a decade ago." He said that this was partly due to the events of 1998 in the aftermath of the Good Friday Agreement, when his enemies within unionism were lining up against him. "They saw the Orange Order, Portadown District and the Drumcree issue as a battering ram that they would use to destroy the Agreement," he said. He said the Order had been manipulated "with the intention of creating massive public disorder and violence so that it would have a political impact". These comments were rejected by the DUP's David Simpson, who ousted Mr Trimble in last year's Westminster election. The Upper Bann MP said the former UUP leader needed "to get a grasp of reality". "I think that if people go back to 1998, they will see that Mr Trimble manipulated the institution in many ways to get the leadership of the Ulster Unionist Party," he said. The Orange Order has also rejected criticism in the book The Orange Order: A Tradition Betrayed by Rev Brian Kennaway. In a statement the Order said it "continues to have a constructive and positive role to play in Northern Ireland and the Republic of Ireland into the future". "The Orange institution remains true to our foundation principles, and any suggestions otherwise are misleading," the statement said. 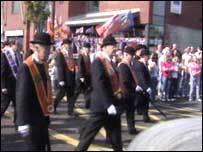 The Protestant marching season is one of the fixed elements of Northern Ireland life, and in recent years some parades have led to disputes and street violence.